LovedInEmerald Damn, I've just found another way of playing which also has put me in trouble. Sadly the people I've been playing don't know where they're supposed to play after . Note: This is in response to a discussion on my homepage which may or may not be there if you look for it (I'm trying to keep it clutter-free so I have been deleting my questions as they are answered). This is the game continuation which I played on the premise that if Black would normally have played at then it was obviously a good place for White to play. 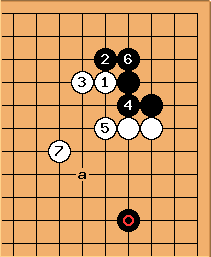 The alternative I thought of was an underpowered extension at a or b; but it seems hard to justify if your extension will be underpowered and Black can then secure the other side with a play at . Anyway, just curious whether I made the right choice, as the game continuation was not in my favour. Charles The usual thing is here, though I wouldn't call as played a bad idea. 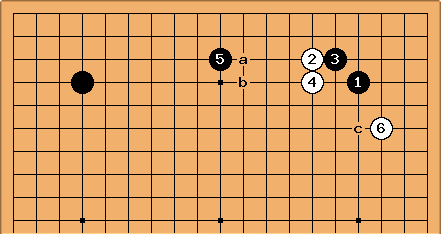 This sequence has been played by pros (Ishida Yoshio tried the + idea at one stage). getting split up (e.g. Black at c above) doubles the trouble. Andre Engels: It seems that this has even been played enough by professionals for a joseki to have been developed. The follow-up in this diagram is what is most played by professionals, although the location of is actually quite variable; a and capping the pincer (when it has been played on the third line) are also seen. LovedInEmerald Damn! Now I have to ask questions outside the safety of the dumb questions section on my homepage :p. Anyways, getting back on topic... Would there be any merit in trying something along these lines? The thing is, I have nowhere near enough experience to get an idea about where these lines would go but it seems to me black has to give up the corner or allow the extension attempted with (only in a different place obviously). 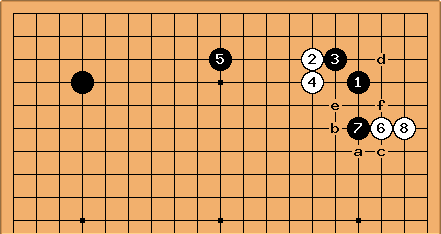 Sorry if this is going a little off topic but this sort of play from black is quite common at lower levels and I would like to have as many ideas as possible to combat it :). Thanks in advance! ps. I don't like the look of but I can't think of a stronger way to support whilst not forcing black to play a specific side. Andre Engels: White 8 is a very strange shape. White's stones are not working at their fullest. I think that after (which has been denounced above), the best way to answer would be white a-black b-white c. White's two stones on the top might come under attack, but white still has the 3-3 point invasion at d, which threatens to link up to both sides if things get too problematic. looks like a good move, but e instead gives a standard double approach move joseki. Andre Engels: At second thought, white a-black b-white d probably looks even better. LovedInEmerald The usual thing is here, though I wouldn't call as played a bad idea. Charles Playing on the other side might be considered typical of handicap go: you can argue that it's wrong in principle and unsound, but in practice it produces a complex situation which gives White chances and some ways to exploit Black's shape.